Just two days prior, the German forces had demanded the surrender of the 101st Airborne, threatening them with "total annihilation." In reply came the answer: "Nuts!" Now, another German attack comes, on a frigid morning, the day before Christmas. From the tree line of the Bois Jacques, the Screaming Eagles respond with thunderous firepower and a battle cry-"Hold fast!" At this crucial hour, these young men will give their country the most memorable Christmas gift of all: Victory. 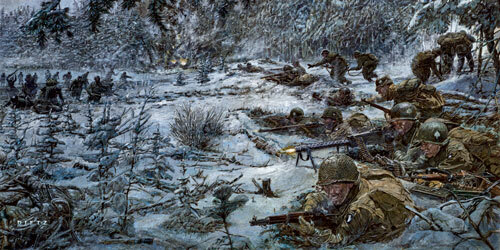 Two days later, on December 26, the German siege will be broken and the battle for Bastogne will be won.